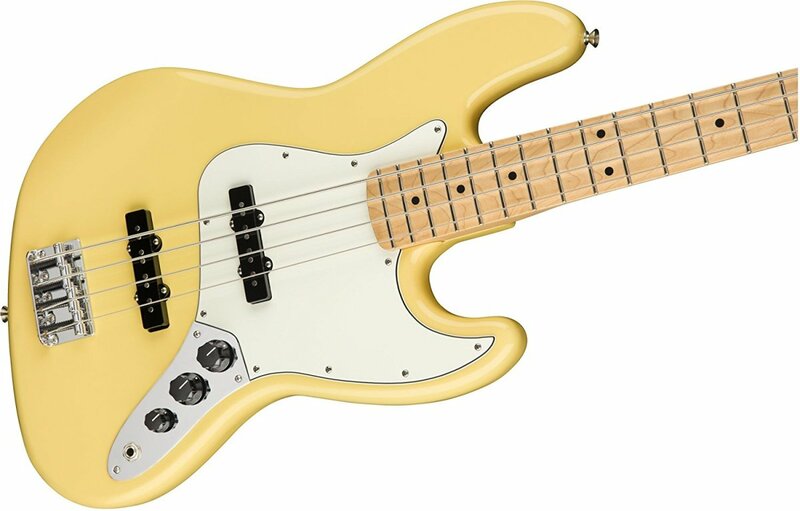 Squier by Fender Vintage Modified Precision Bass PJ: One of the best budget bass guitars under $300! Finding the right bass guitar is hard enough, but when your budget is $300 or less it might seem like the best instruments are out of your price range. While it is true that many outstanding mid-level bass guitars will be beyond your reach, you’ll find there are some real gems out there that you can grab for less than three Benjamins. If you know where to look, that is. This article can help! 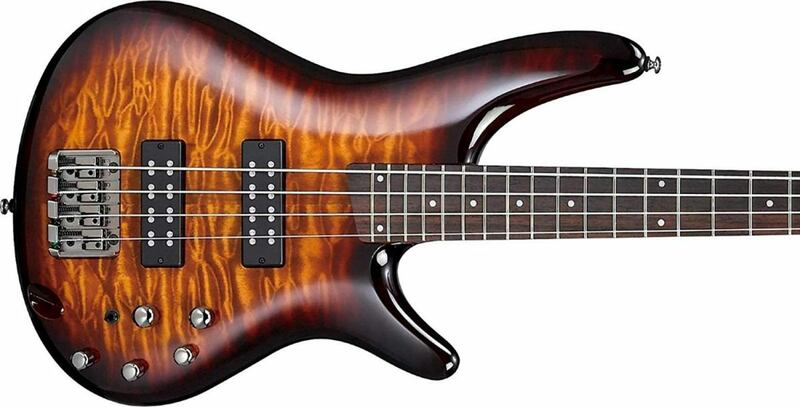 I’ve whittled the choices down to my five favorite bass guitars for under $300. They’re solid instruments made by some of the top bass guitar builders in the world. These bass guitars are perfect for serious beginners, bassists looking to upgrade from a starter instrument, or veteran bassists who want to expand their collections without dropping a lot of cash. When it comes to musical instruments it is as true as with anything else: The lower you go in cost the more you have to worry about quality. That means it is so important to choose wisely when you are in the market for a budget bass. While that should make you think twice about some of the bargain-basement brands out there, when we're talking about companies like Ibanez, Fender, Jackson, Epiphone and Music Man you can rest easy knowing their reputations for excellence extend to their mid-level gear. These are some of the top bass guitar companies out there. That’s why they made my list, and I wouldn’t recommend them if I didn’t think you could trust their stuff! So let’s look at some bass guitars! I’ve always been a huge fan of Ibanez bass guitars, and their Soundgear line in particular. My first real bass was an Ibanez SR400, which is a notch or two above the SR200, but very similar in appearance and function. Ibanez SR bass guitars are known for being light and easy to play, with fast, thin necks. They are also very flexible, thanks to the powerful tone-shaping circuitry. The GSR200SM makes use of the Ibanez Phat II equalizer, which consists of a tone knob amd the Phat II EQ control. There is also a volume knob for each f the Ibanez Dynamix P and J pickups. This is an passive bass, meaning the circuitry described above does not require a battery to operate. Passive basses tend to sound more organic that active, with nice texture to the their tone. However, like most Ibanez SoundGear basses, the EQ controls here are still pretty powerful. The GSR200SM tonewood profile features a poplar body with a pretty spalted maple top, a neck and Jatoba fingerboard. 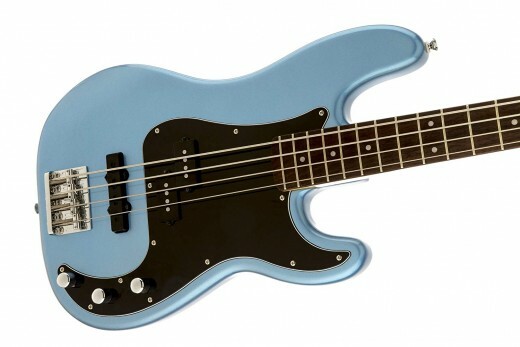 Notes: The basic GSR200 made my list of the top bass guitars for beginners. There is also a five-string version of this bass (GSR205SM) and a six-string (GSR206SM). The Squier Vintage Modified Series has really surprised a lot of musicians in recent years, even some of us who have been around the block a time or two. There are several basses in the Vintage Modified lineup, but the Precision PJ version is perhaps the most versatile. You already may know that Squier is a Fender brand, and this Vintage Modified bass is actually intended to replicate a Fender bass. That accounts for the cool retro looks. The Vintage Modified Precision Bass PJ features agathis body, maple neck and maple finger board. You get a J-style pickup at the bridge, along with the classic split-coil P-Bass pickup.The tone is textured, punchy and, with some proper knob twiddling on the amp side, you’ll have no trouble finding the low end you need. Like the classic Fender Precision Bass, this Squier version features passive electronics, so you don’t have to worry about a battery. And there is even more awesomeness to be had in the Squire Vintage Modified lineup. For a few bucks over your $300 budget you can grab the '70s version of the Vintage Modified Jazz Bass. The Squier VM ‘70s is capable of some pretty impressive tones, available by blending different combinations of the two pickup volume knobs, and tone control. Of course, I may be a little biased. I happen to have one of these guys in my guitar collection, and I love it. Even after 20+ years of playing bass I find it impressive, and it costs way less than it should. Check out all of basses in the Squier Vintage Modified lineup before making your choice, but you can’t go wrong with the PJ or '70s model. 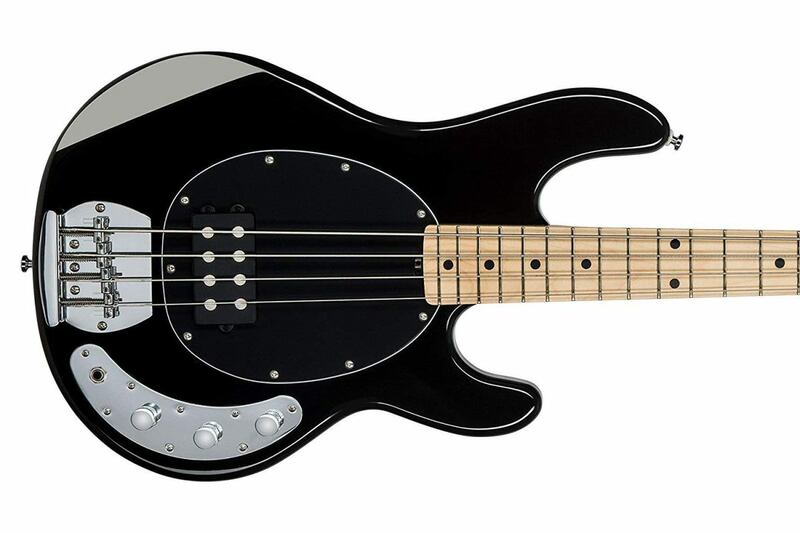 The Music Man StingRay is a legendary bass known for its fat, growly tone and unique design. Of course you’re never going to find a StingRay for under your $300 budget, but you can grab one like it. The Music Man Sterling Ray 4 is an affordable version of the StingRay with many of the same distinctive features as the monster bass it was modeled after. Many bassists love the StingRay sound, made possible by a huge bridge-position humbucker. The Ray 4 has the same design, with a high-output humbucker and a two-band active EQ. Other features include a hardwood body, maple neck with a slick satin finish and controls for volume, bass and treble. The bass also has the looks of a StingRay, with the classic body shape and 3+1 headstock design. Bassists in all genres value the StingRay for its unique tone, and the Ray 4 is a great way to grab that sound in a very affordable package. The single pickup is surprisingly versatile. If you want to take a step away from the standard two-pickup bass design and forge your own path, this is a bass to consider. Note: The Sterling S.U.B Ray is also available as a 5-string version in the Ray5. The next bass on my list certainly stands out from the rest! The Epiphone Thunderbird is modeled after the classic Gibson Thunderbird and shares many of the same attributes. Epiphone builds their gear based on Gibson specs, so you know you can expect the best. The Thunderbird is an interesting bass in that it has the edge to get the job done in hard rock or metal, but it is also classy enough to use in any genre. With its reverse body and sunburst finish it has the looks to stand apart from just about every other bass in the world, but of course what really matters is sound. According to Epiphone’s website, the Epiphone Thunderbird features a mahogany body with a hardrock maple bolt-on neck and rosewood fingerboard. The pickups are Epiphone’s Thunderbird Bass Plus Humbuckers, and controls are set up J-Bass style with a volume knob for each pickup and a single tone knob. Thunderbird tone is growly and warm and perfect for rock music. The electronics are passive, but the humbuckers and mahogany body bring a slightly more aggressive vibe than the typical Jazz-bass sound. Still, roll the controls in the right direction and this bass will do jazz, blues, country or just about anything else you ask it. Note: The Epiphone Thunderbird is also available in a Goth version with a black-on-black finish, and a Pro version with active electronics, neck-through construction and other upgraded appointments. The Jackson Concert Bass is a classic, and if you’re into metal you’ve no doubt seen it around. Jackson is the premier name in metal guitars, and the Concert Bass is their epic entry into the bass world. Like much of Jackson’s lineup, this design is available in models ranging from beginner’s instruments to custom-shop gear for pros. The JS Series is Jackson’s attempt at bringing their legendary guitars into a price range just about anyone can afford, and that the JS2 Concert Bass will get you that Jackson vibe while keeping you under your $300 budget. It’s a Jackson through and through, right down to the shark-fin fretboard inlays. Features include an Indian Cedro Body, maple neck and rosewood fingerboard. Pickups are a pair of Jackson high-output bass humbuckers and the hardware includes a Jackson high-mass bridge for great tone and sustain. If you know you are going to primarily subject your bass to hard rock and heavy metal this is an instrument to consider. There is good reason so many guitarists and bassists in the metal genre have chosen Jackson over the years. Also note that this bass is available as a four and five string with active electronics in the slightly pricier JS3. So which bass should you choose for your style and needs? Each instrument presented in this article has its own set of attributes that are more or less suited to different goals. You can find some similar basses that wouldn’t be bad choices either, but these 5 bass guitars I feel are tops in their respective niches. If you want a bass for rock, jazz or funk you might look to the Squier by Fender Vintage Modified Jazz Bass. It has classic Fender J-Bass features and it is a tremendous value. The Ibanez SR250 is a quality instrument and probably the most flexible of the lot. If you play metal or jazz you’ll love the tone-shaping options and thin neck, but this bass can find a home in any genre. The Sterling S.U.B. Ray4 brings that snarling StingRay humbucker power down to a price anyone can afford. It’s a powerful rock bass with a unique look and sound. The Thunderbird IV is a Gibson classic in an Epiphone package. It’s a hard-driving rock bass with the tone for any genre where you want to make a statement. Finally, the Jackson Concert Bass is a metalhead’s dream. The brand name Jackson has become synonymous with metal and the JS2 Concert Bass carries on the tradition. No matter which you choose you won’t be disappionted, so figure out which one calls to you and go for it! Good luck with your new bass! Which budget bass do you like best? @Mat - I don't believe they are quite that high, but it does seem the price has been bumped up over the $300 mark. Some sellers might have higher prices, which is why it is always a good idea to check with the manufacturer to see where they are setting it. I still think the Thunderbird is very good bass for the money. Just a followup - Epiphone and Gibson have moved the strap button from above the neck to the neck plate/heel area of the Thunderbird basses. 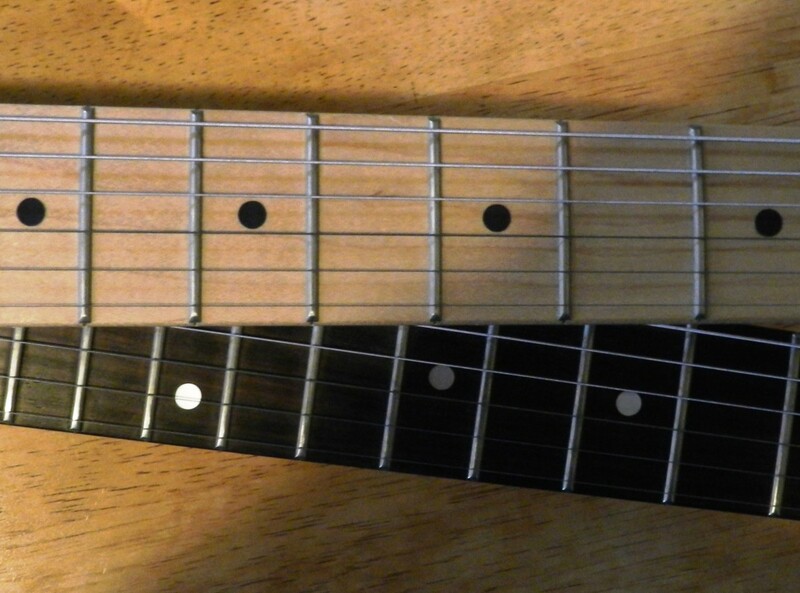 This is actually a common neck dive fix for a lot of modders, and clearly someone at Gibson was listening. I'm a beginner and I purchased the Epiphone Blackbird by Nikki Sixx and I have to say out of the 20 some odd instruments that I own this is the best instrument I have by far! Another trick that works well with tbird basses is to use a wide acoustic strap, tying off at the headstock folk-guitar style. This can help with neck dive, but may not satisfy everyone. for those having troubles with thunderbirds dropping on them, try a leather strap with suede backing. Italia straps make them. The suede anchors the bass in place and keeps it there. Hi Jonno. That's a common complaint about the Thunderbird. I suppose its a trade-off, but certainly if you are standing and playing for long periods of time it is something to consider. Hope you found a different but equally awesome bass to replace your Thunderbird! I owned a Thunderbird for a few years. The sound was terrific, and its a beautiful thing. But the head drops the moment you stop supporting the neck - for me that made it very uncomfortable to play. The AXL AJ-800-SN Marquee Capricorn should totally be on this list. It is not only less than $300 but I can honestly say it is one of my personal favorites, that's coming from a guy who has played quite a few gibsons, fenders, deans and countless others.